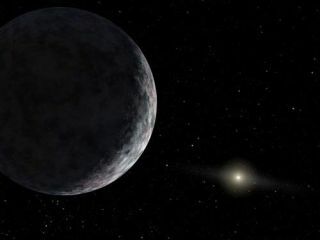 An object discoveredearlier this year and considered by some to be our solar system's 10thplanet is indeed larger than Pluto, a new study confirms. The object, catalogued as 2003UB313, is by many accounts a planet. It is round and orbits the Sun. But because several other objects meet those criteria andalso approach Pluto's size, astronomers have been wranglingfor months over how to define the word "planet." It is not known if or whenthe International Astronomical Union, which rules on such things, will issue adecision. Members of an advisory board weighing the issue can't even agree onthe parameters of a definition. Meanwhile, 2003 UB313 is now known to be about 1,860 miles(3,000 kilometers) in diameter, give or take 190 miles (300 kilometers). Pluto is 1,430 miles (2,300 kilometers) wide. The object's size was initially calculated based on anestimate of how much sunlight it reflects. But astronomers don't know exactlywhat its surface is made of, so they could not be sure how reflective it is. The new study, led by Frank Bertoldi from the University ofBonn, relies on new observation of 2003 UB313's thermal emission. Thecalculations are based on the object's size and its surface temperature, whichcan be estimated based on the object's distance from the Sun. The results are detailed in the Feb. 2 issue of the journal Nature. "Since UB313 is decidedly larger than Pluto,"Bertoldi said, "it is now increasingly hard to justify calling Pluto aplanet if UB313 is not also given this status." But 2003 UB313 is much farther away. Its elongated orbittakes it far out into the icy KuiperBelt, twice as far from the Sun as Pluto. Many astronomers now say Plutois a Kuiper Belt Object and should never have been called a planet. So if 2003 UB313 is termed a planet, as some suggest, then ahandful of other good-sized, round worlds known to exist--and perhaps hundredsyet to be found in the Kuiper Belt--would also have to be called planets. Amongthe other candidates: Sedna,which is about three-fourths as large as Pluto, 2004 DWand Quaoar. One suggestion is to call the outer worlds "dwarf planets." "Whichever way you care to count them, with the discoveryand measurement of the size of 2003 UB313 there are no longer nine majorplanets in the solar system," Sheppard writes in an analysis for Nature. Sheppard also notes a surprise that's come from this studyand others recently. Astronomers have now accurately measured the diameter andreflectiveness, or albedo, of a handful of Kuiper Belt Objects. "It seems that the largest objects have the highestalbedos," Sheppard said. "This could be because gravity on these objects islarge enough for them to have active atmospheres and so be able to retainvolatile gaseous substances that could brighten their surfaces."